I cannot believe how teeny you are still! Life is definitely not fair. 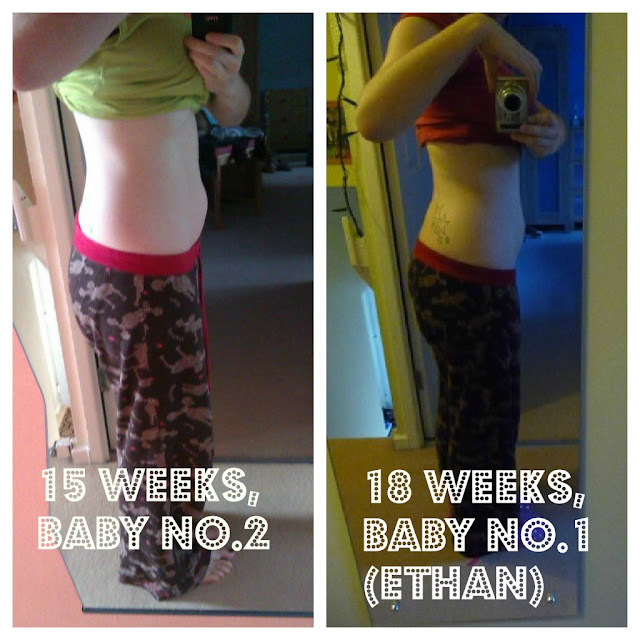 I was bloody huge by 15 weeks with Rory (well, my baby bump way - I felt so sick that the rest of me was scrawny - ha, shame that didn't last). boo. Hope the nausea eases soon, I found by 18 weeks it had mainly passed this time around, so hopefully it won't be too much longer for you. I have definitely found this pregnancy much harder than I did with Alex, but I think that must be a combination of having a young boy about and all the extra day to day tasks that come with that/your body has done it all before! Try to take it easy when you can! Lots of people keep saying that it must be a girl this time for me as I have felt so different, but like you I haven't wanted to tell myself that!